Well, Chris here's one experience I can remember from a few years ago. 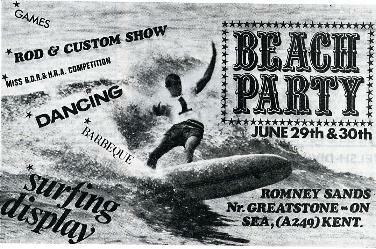 A bunch of us guys from the BDRA decided one year that we would like to emulate one of those good old beach parties that we'd see on the flick's, you know the type, Bobby Darren, Paul Anker jobs with all the trimmings, birds, beer, and Beach Boys. So we all set of to Romney Sands complete with our trusty old C10 Chevy pick up full to the gunnells with Colt 45, Coca Cola, Wild Turkey whiskey, and any other beverages the USAF procurement dept (part of our crew) could acquire. We set off with any and every Drag car that could make the weekend, by it's own steam, in John Woolfe Racings case, a complete Fiat double decked transporter full of strip only machinery. From what I can remember I drove down in Dave Riswicks 55? Chevy Bel Air, 283ci small block, fitted with Crane cams street strip gear,Edelbrock manifold, Holley double pumper 650cfm carb open Blackjack Header (no mufflers) system. slight problem with this type of set up on the street is that it tended to load the engine with unburned fuel unless you kept clearing the plugs when sitting at traffic lights, more of this later. We arrive Saturday lunch time I think, anyway set up camp, got the tents set out on the beach, sound system belting Jan & Dean, Beach Boys Surfer girl, Little Deuce Coupe, Ballad of Ole Betsy, fire was alight, drinks unloaded, the sun was real hot, things were beginning to take shape, we could have all been in California, it sure did feel like it. Well, we all had a blinding night. However not much could have been said of the following day. I woke in the morning to find some bugger had moved me tent about five foot in front of me and this young lady who must have crept into my tent in the middle of the night without me knowing. After brushing myself down, and removing sand from places it shouldn't have been, I noticed a very well dressed gentleman poking around in our fire, and kicking ash all over the place. I went over to see if I could help. "Good morning" I said, "is it?" he said, "you wouldn't have see a pair of very expensive wooden ornamental gates anywhere?". "ermm, well ermm, Ronny, chap here looking for a pair of gates, seen anything Ronny? ", (Picardo that is), "Ha,ha,ha, what would I want with a pair of gates? Bloody heavy" at that moment the guy turned over a pair of rather nice looking flash hinges in our fire very similar, according to him that is, to the one's that adorned his front gates. Good old Ron true to form then said "oh! you mean that set of gates, no haven't seen em!" Well the chap was not best pleased and went off ranting something about an officer of the law. We decided on a majority vote to leave the area a bit quick, leaving behind in true drag racing style, large black lines down the coast road and clouds of tire smoke. Reaching the towns first set of traffic lights we had to stop on a red light. looking to my left I noticed Constable plod leaning on his push bike talking to a couple of locals. Well as usual the old Chevy was sooting the plugs up, so it was time to blip the throttle (no mufflers) to clear her out. Constable plod nearly fell backwards over his crossbar, bloody great cloud of black smoke shot out the back of the Chevy, poor guy in a convertible Morris Minor behind looked like somebody from the Black & White Minstrels, light changed to green, foot to the floor, pair of Goodyear's belching white smoke from the wheel arches, a Texan guy in the rear seat shoved up somewhere around the rear parcel shelf shouting something about sunburn and could I ******* slow down so he could sit back in the seat. By this time Constable plod had found the pedals on his bike, but was still having trouble with co-ordination. He eventually managed to get him self together, but by this time we were long gone. Brilliant! So there you are folks, there's an example of the kind of thing we're looking for. E Mail me your story and I'll put it on this page in the near future.